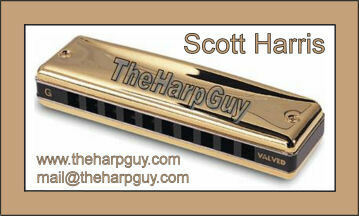 My new book will teach you the basics of music and how it relates to playing the harmonica. I have a lot of experience playing live with various bands. If you are looking for a harmonica player to play with your band, or for a special live-event, you are in the right place. I have extensive recording experience, both analog, digital and MIDI. I have written, performed and recorded many original compositions, playing or programming all of the instruments. I have developed techniques for dramatically improving the playability of 'stock' harmonicas you can buy in most music stores. Due to imperfections inherent in the process of mass-producing harmonicas, 'stock' harmonicas generally require some level of adjustment and customization to get them to play at their best. I have found that making these adjustments helps new harmonica players succeed more quickly, and gives them more desire and motivation to practice and learn more. I have taught college-level courses, which, when combined with my extensive experience playing, customizing and writing about the harmonica makes me a uniquely qualified and effective harmonica-teacher and public-speaker.